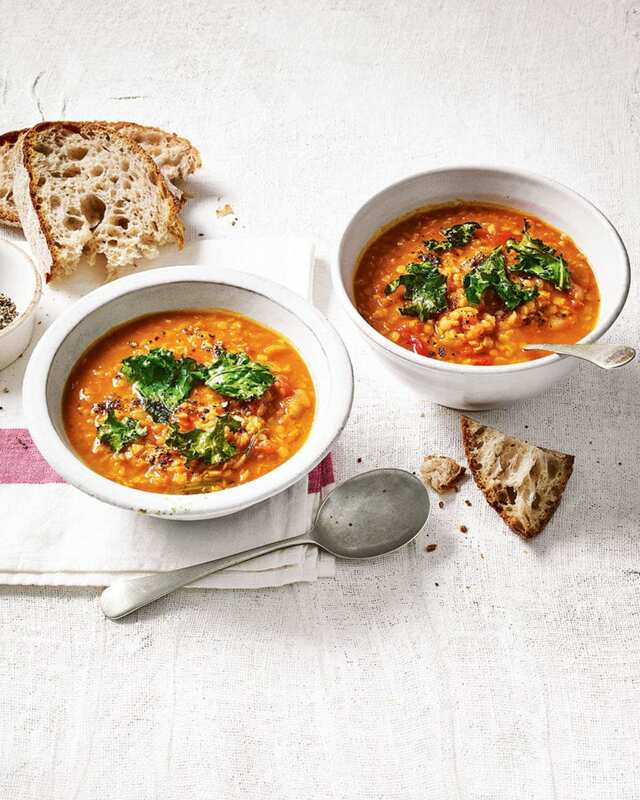 Switch up your soup game with our spicy lentil, tomato and paprika recipe served with a garnish of crispy kale. Heat the oven to 190°C/170°C fan/gas 5. Heat the 1 tbsp oil in a large saucepan, add the onion and cook gently for 10 minutes, stirring occasionally, until softened. Add the crushed garlic, rosemary, paprika and lentils, then cook, stirring, for another minute or so. Pour in the chopped tomatoes and stock, bring to the boil, then turn down the heat and simmer gently for 20 minutes until the lentils are tender. Meanwhile, toss the kale in a splash of vegetable oil and spread out over a large baking tray. Sprinkle with salt and bake for 8-10 minutes until crisp. in warmed bowls, topped with the crispy kale and with crusty bread for dipping. If you like a spicy kick, add Tabasco to taste or top with sliced fresh chilli.